Boiler water is the term used specifically to refer to water which is heated inside the actual boiler . Boiler water is provided by the boiler feed water from the boiler as either heated water or steam. Boiler feed water: The water which directly enters the Boiler. Boiler feed water is made of Makeup water and Return Condensate . Makeup Water: Make water is the original raw water derived from well or any other source and purified to the extent required. Return condensate: Return Condensate is water which passes through boiler , gets converted to steam and after serving some purpose condensed back to liquid water and returned to feed water tank. A Boiler plant is a critical part of an Industrial concern. In any process Industries, the steam generators are act as vital role. The purity of boiler water and steam is one of the most important criteria for ensuring component availability an reliability in power generating systems . From the chemical analysis of raw water we get all the information about quality of raw water. It may vary source to source. Following are the different types of impurities which are generally present in any types of water. The types and percentage of impurities vary according to source of the water like river, lake, bore well etc. In raw water, total alkalinity primarily covers bicarbonate. A small amount of carbonate might also be present. Hydroxide ions do not exist in raw water. Total alkalinity in raw water is important since it represents a potential source of scale. Caustic in boiler water may or may not be desirable depending upon the operating pressure . Carbon di Oxide is a primary source of condensate line corrosion. In majority of raw water calcium is the main source of hardness. In boiler and cooling water systems calcium salts are the main cause of scale. Scale is not a problem where chloride salts are concerned, but they are very corrosive in oxidizing environment. Chlorides are prominent in crevice corrosion and pitting. In all cases of designs or operation, steps should be taken to prevent the concentration of chlorides. Iron is normally found in soluble ferrous form. On contact with air or oxidizing agents, iron is converted to ferric form and forms insoluble hydroxides or oxides. If iron is more than 0.3 ppm or greater, it should be reduced or controlled. Magnesium usually forms hydroxides or silicates in boiler water, which are desirable types of sludge. If boiler water alkalinity is low, undesirable magnesium phosphate often forms which is sticky and scale forming. In cooling water system, magnesium only precipitates when pH is over 10.0. The raw water pH will be in the range of 5.5 to 8.0. Low pH can result in corrosion and high pH can result in scale formation. It is usually found in ground water and silica content of 70-80 ppm is not unusual. In high concentration, silica can cause scale problems in cooling water systems, as well as in boilers. Silica control is important especially in high-pressure boilers, since silica can vaporize and deposit in low-pressure areas of turbine, as well as, super-heaters. Most raw waters contain sulphates . Presence of sulphates aggravates corrosion and sulphates are found in scales usually as calcium sulphate. It is a general indication of corrosiveness of raw water . The conductivity test, though not accurate is a convenient method to check the TDS . Any change in raw water composition is reflected by the change in conductivity. Hardness of water is expressed in parts of calcium carbonate per million parts of water. It also expressed in grains of CaCo3 per gallon of water 14.28 parts of CaCo3 is equals to one degree of hardness. There are two types hardness in water. Temporary Hardness causes carbonate hardness which is soft and porous. Permanent Hardness in water cause non carbonate hardness which is hard in nature. Water is the essential medium for steam generation . Conditioning it properly can increase the efficiency of boiler and as well as extend the boiler’s life. Treating boiler water also ensure safe and reliable operation. Without proper treatment boiler itself can be destroyed . Boiler water problem generally falls into two classes, deposit related and corrosion related . There are many instances where deposit causes corrosion and corrosion causes deposit. To prevent corrosion in the boiler and steam system. To prevent the formation of scales and deposits on heating surface. Maintain a high level of steam purity. The maintenance of steam purity is also important. Certain impurities can be carried over or dissolved in steam and can be deposited in the super heater or on the turbine blades. Gaseous impurities are objectionable where the steam is condensed after use or is used in heating system. Due to these conditions foaming and priming will happen. Foaming : Foaming is responsible for the majority of carry over problems in boilers and is usually the result of too high a concentration of solids in the boiler water. Corrosion: The most common example being the attack of steel by oxygen. This occurs in water supply systems, pre-boiler systems, boilers, condensate return lines. Oxygen attack is accelerated by high temperature and by low pH. 4H2O + 3Fe → Fe3O4 + 4H2. Due to scale formation in a boiler, heat transfer is retarded and plates and tubes get over heated , bulge and rupture. Due to electro chemical action , presence of oxygen in boiler water pitting and corrosion is caused. CO2 in boiler water forms ferrous carbonate and converts it to ferric hydroxide and later to ferric oxide called rust. Due to hydrolysis , unstable salts of Ca and Mg , mineral acids are formed and tubes get overheated. Due to untreated water pitting and thinning of tube walls or plates is caused from water side. Dissolved oxygen causes corrosion of surfaces from water side excess concentration of hydrogen or hydroxyl ions corresponding to decrease or increase in pH respectively. pH : Corrosive action of water is minimum which the pH is distinctly on the alkaline side. i.e. 8 and above at pH 9.0 protective film of ferrous hydroxide is formed. Some times condensates owe their alkalinity to dissolved NH3 release NH3 with drop in pH. 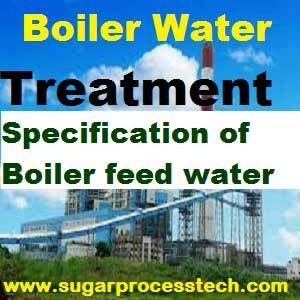 A treatment for boiler feed water may be divided into two broad classifications – external and internal treatment. Raw water is treated before it is fed into the boiler. This is known as External treatment. The goal is to improve the quality of water before it is used as boiler feed water. Technically , treatment methods are aimed at reducing alkalinity , hardness , silica , iron, manganese, turbidity , bacteria , organic matter and others . In boiler feed water treatment helps in preventing corrosion , scaling , overheating. One of the critical parameter is Hardness , Which is one of the major factor for scaling. Hardness is removed by Ion exchange process or other external treatment like lime soda or Reverse Osmosis (RO). In case of internal treatment chemicals are introduced into the boiler water and the precipitated salts are removed in Blow down. To increase the pH of water, Caustic soda flakes and Tri Sodium Phosphate are used in solution form. To minimize the hardness , Sodium Hexa Meta Phosphate is used. To maintain the phosphate level , Sodium Hexa Meta Phosphate or Sodium Phosphate are used. To minimize the dissolved Oxygen level; Hydrazine, Sodium Sulphite are used. By increasing the feed water temperature 100° to 110°C, Dissolved Oxygen can be minimized. To maintain the caustic alkalinity, caustic soda and Tri sodium phosphate are used in solution form. Maintenance of pH of water in the desired range is required to control corrosion. Oxygen in feed water should be controlled with in 0.007 ppm, priming by good aeration, supplemented by Hydrazine dosing. D.M water storage tank should be properly sealed. Condensers and Heaters should be air tight. Proper wet lay up of units during shutdowns. The object of blowing down a boiler is to maintain the concentration of dissolved and suspended solids within the specified limits to avoid priming and carryover. This is installed in order to regulate and maintain the boiler water concentration at a constant level. The percentage of blow down should be controlled to a minimum necessary to achieve this. This is resorted to only when the water analysis shows it to be necessary or when an immediate change high boiler T.D.S is required. And then only on the instructions of responsible person. Steam drum water level must be closely monitored during any blowing down operation and maintained as nearly as possible normal. When opening blow down or drain valves to admit steam or hot water into relatively cold plot lines, open slowly so as to avoid sudden shocks or water hammering which may cause serious damage. Please confirm the return condensate quantity wrt steam used in process house. Return condensate Qty depended upon vapour bleeding system in process.